Ralph Gruendling joined Palmetto’s pastoral team in 2017. Sensing God’s leading to vocational ministry during high school, he completed his formal education with Bible College and Seminary degrees. His prior church staff experience was with Forest Hills Baptist Church in Decatur Georgia and Oakwood Baptist Church in Anderson, SC. 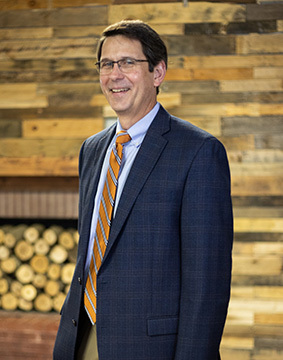 He is a co-founder of Worldwide Tentmakers, Inc, a mission agency that exists to assist local churches in the identification, preparation, and placement of self-supporting witnesses, worldwide. He served the ministry for 25 years. While serving Worldwide Tentmakers Ralph sensed God’s leading to model the self-supporting approach to ministry. Ralph left the vocational ministry to pursue a career in business. While modeling the tentmaking/self-supporting approach to the ministry he used his ministerial training, experience, and skill set to serve another local church for 20 years. Ralph’s career in the financial services industry includes 22 years of experience with New York Life Insurance Company where he is a Senior NYLIC, has qualified for the company’s Quality and Executive Councils and has been a qualifying member of the Million Dollar Round Table. Ralph has been married to Rebecca for more than thirty years. They have two sons, Caleb who is married to Lauren Grace, and Seth who is engaged in finalizing his college education. Ralph and Becky are also foster parents and foster grandparents.